I'm up for this. Granted, I wasn't particularly enthusiastic about Tennis Open or Castle Club Clubbish Tour, but I could get into both the footie (I've never played a Mario football game! ) and the horse-racing. More Nintendo racing games? Yes please. 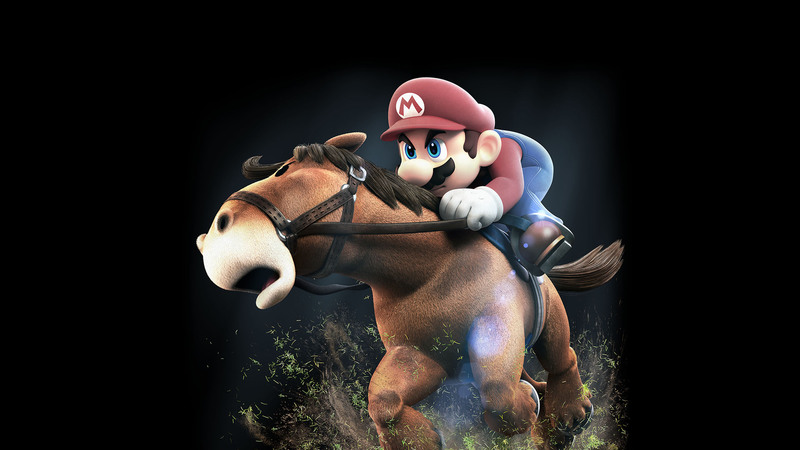 Horse racing looks amusing, a more grounded mario football could be fun and tennis is always a quick laugh. All on one cart with online multiplayer? I'm in. Whilst I wish the football was more in the same vein as Strikers as opposed to being closer to a sim, it's looking like there'll be a fair whack of content in this. I've not played a Mario Tennis game in ages too. Who knows, this might be the game to finally get that return to arcadey football right! It looked suitably arcadey from the gameplay footage they showed off, but I want teleporting Dry Bones and Hammer Bros battering Luigi in my Mario football games. Don't get me wrong, I love Mario Strikers but I have plenty of friends who don't, and I'm always up for something different. From the trailer it did look a bit easy to score in the football; that aside, I am as up for this as one can be. My Direct highlight - they just better have the content right. This was unexpected... but I'm very keen. As all y'alls have said, it's like they've fixed the recent Tennis and Golf games... and then made 3 other things. It's weird seeing Monty Mole and the concept of wing backs in the same screen. But I'm cautiously optimistic! Maybe not horse racing though. Should have been track cycling - Omnium, like. Trotty and Kenny amiibos. Wash your mouth out Jim, that's the sort of talk that had people wanting Danica Patrick in MK8. Horse Racing was bit out of left-field, wasn't it? I was fully expecting basketball considering, y'know, there's already a precedent for Mario to shooting some hoops, but I suppose it couldn't be a total retread of old ground. During the Direct a few Twitch comments along the lines of "NO BASKETBALL" skipped past. 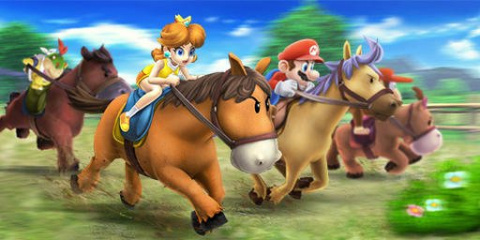 Horse racing is a very oddball - and therefore totally Nintendo - choice. 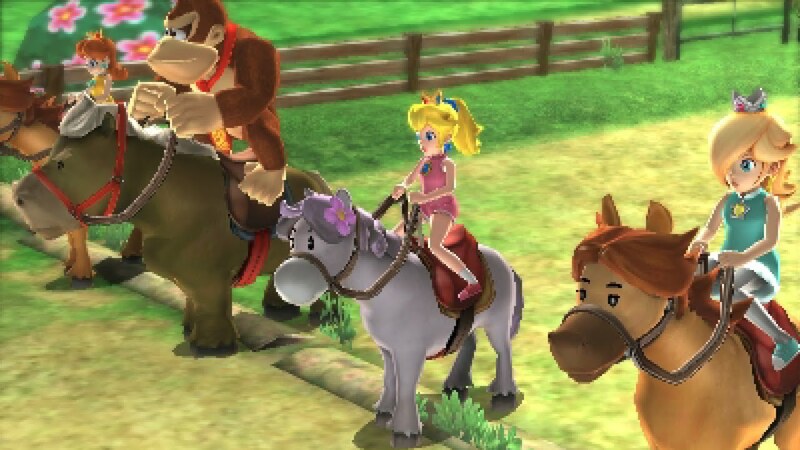 It also looked like it plays like controlling Epona, which means I'm very interested to see more. It's definitely the one I'm most excited for, primarily because it's new. Mario Super Baskets 3-on-3 Coin Collection Dullstravaganza (or whatever it's called) wasn't a lot of fun, I'm glad we're not getting another one of those. To be fair, I reckon they'd have ended up reworking Mario Hoops and Dunks in some way, much like Mario Football is shaping up to be a different beast from Strikers. I wonder if the football will be like this? I really really hope this is a return to form for the Mario sports games, I'm talking toadstool tour quality here & not just for the golf. The quality of the Tennis and Golf looks a lot like the genuine article so I get the feeling they're shying away from them being stand alone titles after recent poor efforts. Football and Baseball seem just as fun as their Cube/Wii counterparts and Horses are pretty swell too so all in all seems like a very good collection. If I'm nitpicking I'd like a version of Hockey similar to version they had back on one of the Mario Party games, that was stellar. And the beach volleyball! Both ace. Toadstool Tour was definitely the last great Mario game, I hope this can recapture even a fraction of the magic. If I'm honest I'm expecting a relatively magic-free but fun 7/10 offering. If I'm nitpicking I'd like a version of Hockey similar to version they had back on one of the Mario Party games, that was stellar. I was thinking about this game this morning as it was one of the surprises of the direct but is it really that good as the football & horse racing are both in the Rio Olympic games and Tennis & Golf likely just reworkings of the 3DS games any way, that most of this game is already available but without Sonic characters and gymnastics. I'd say it's looking like a damn fine package - the fact they went out of their way to say "oh, and there's single player content!" is really reassuring too. I was thinking about this game this morning as it was one of the surprises of the direct but is it really that good? Exactly! Just look at how much personality these Horses have. Though Donkey Kong's looks more like a giant Lion of some kind. Also why does this one look so scared? Is Mario digging spurs into it's ribs?